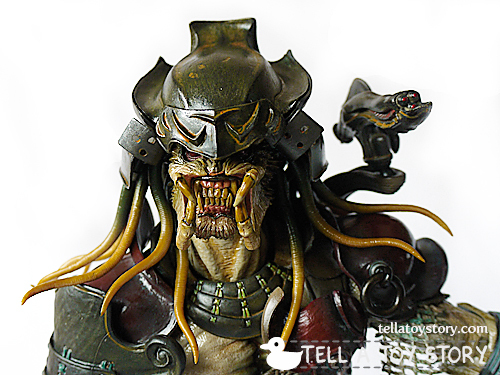 Hot Toys Samurai Predator – The first in a collaborative artist impression series featuring the works of Takayuki Takeya (竹谷隆之) and Yuji Oniki (鬼木祐二) from Japan and Hot Toys from Hong Kong. 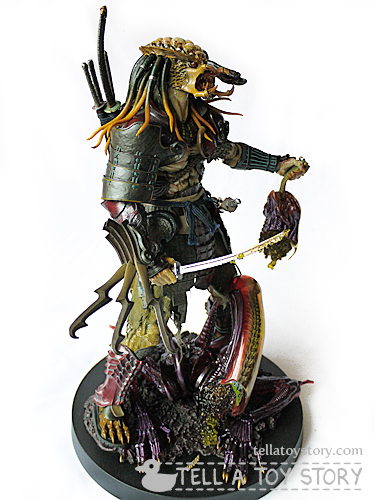 The Samurai Predator does not appear in any AVP movies but it is not difficult to imagine him integrating into the Samurai culture after witnessing their honourable and fearless fighting spirit throughout medieval Japan. 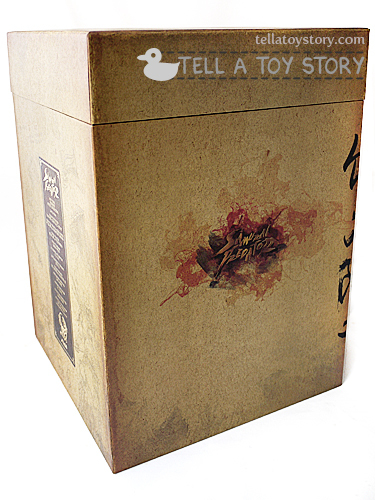 The 1/6 scale collectible figurine comes in huge carton box that weighs almost 5kg! Inside, you will find a box that in itself is a work of art. The back of the box with the names of the artists, designers, painters and sculptors. 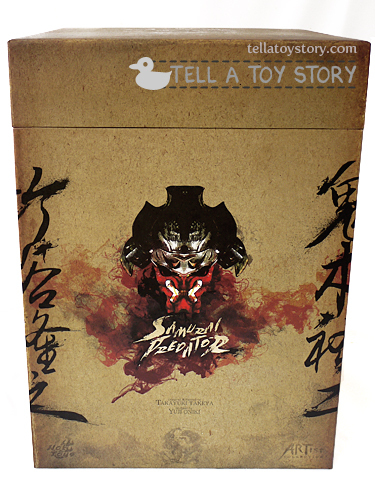 The side of the box with the samurai predator logo, both sides feature the same design. 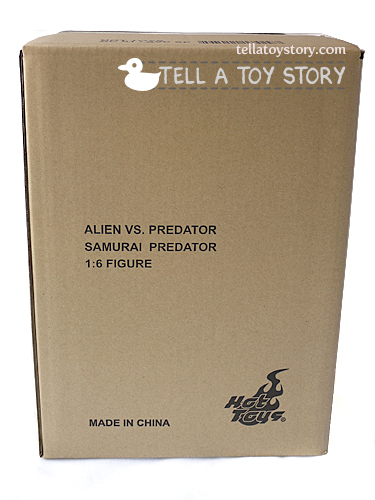 The top of the box incorporates a stylized depiction of Alien vs Predator. Nice. 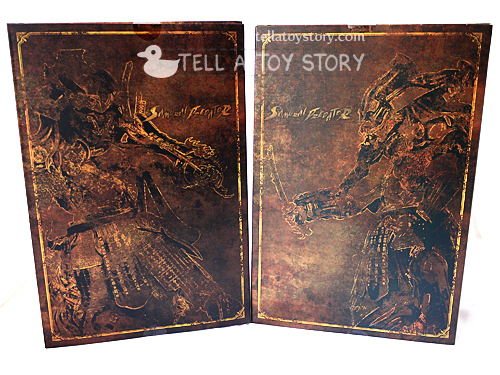 Remove and top cover to reveal the two inner boxes containing the base and figure. Here are the two inner boxes holding the base and figure. 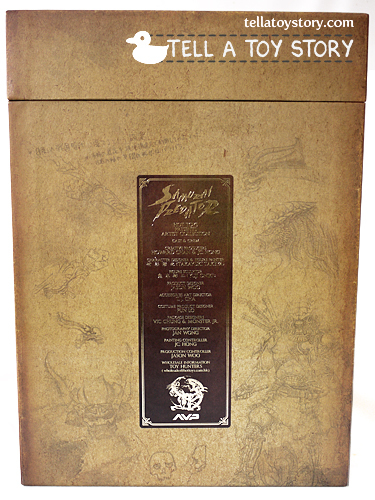 The back of the boxes are very nicely designed as well. 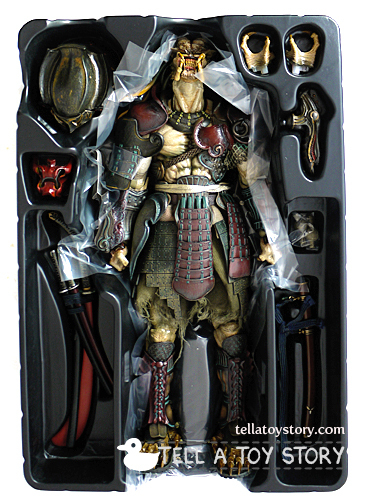 A look at the layout of the inner box containing the Samurai Predator figure. 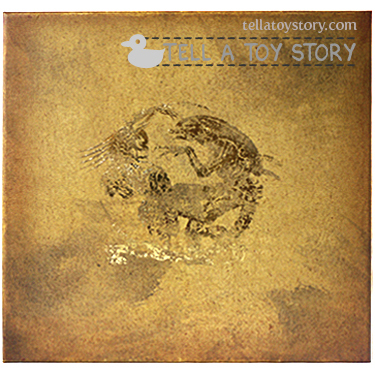 And here’s the layout of the inner box containing the base. 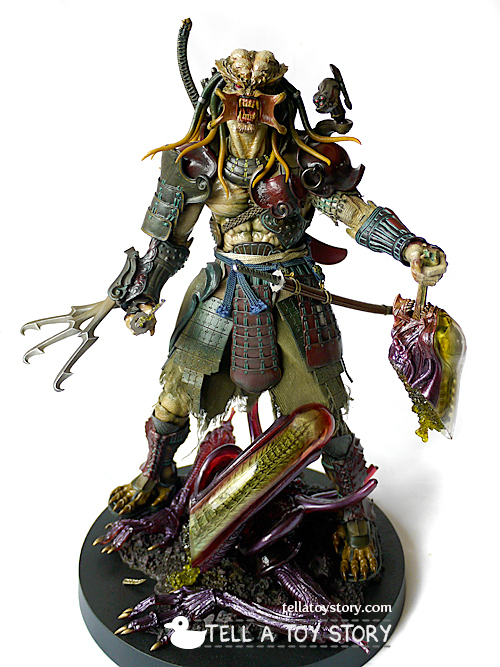 With some basic assembly, you have the completed Samurai Predator holding the defeated Alien on a diorama base. His back view with helmet. 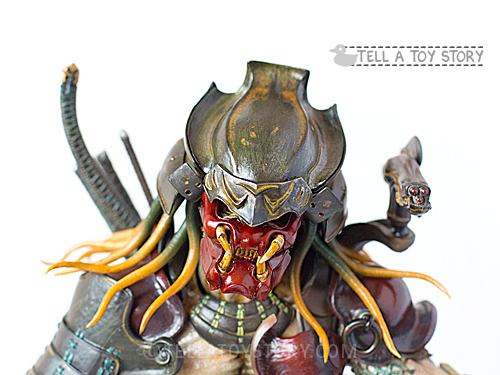 A closer look at the Samurai Predator with helmet and mask. 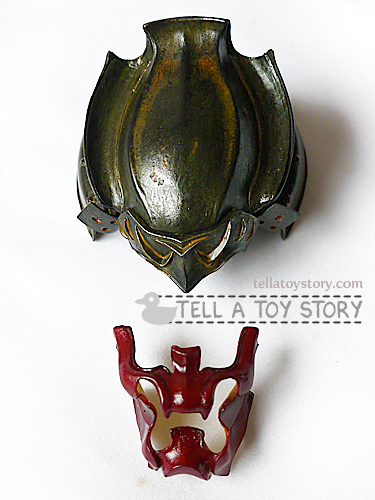 The rusted weathering on the helmet is very realistic. The design of the plasma caster fits in well with the overall look too. Here’s the look without the mask. Remove the helmet to see the unique head crest. His lower jaw can be swung open. 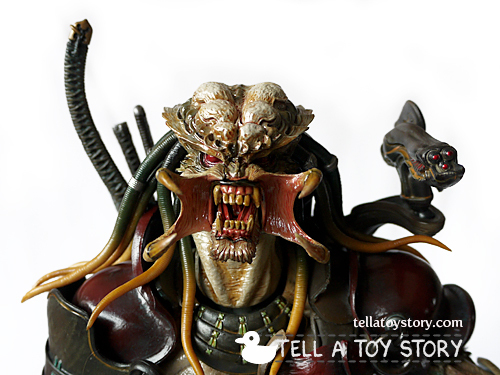 Attach the open mandibles to complete the roar. Fearsome! Helmet and mask when not worn. 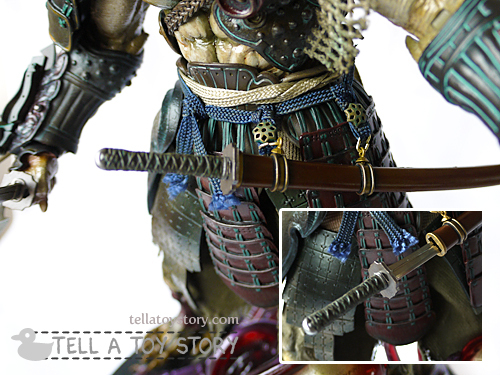 The katana hanging on his waist can be unsheathed and the blade is made of metal. Here’s his back view again without helmet. See the bunch of katanas on his back. The individual swords cannot be unsheathed but still a cool set of accessories nevertheless. 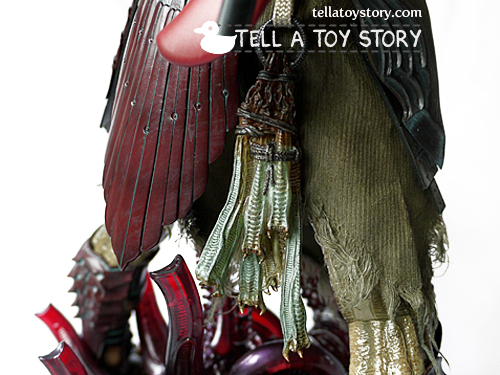 A bunch of severed Alien tongues hanging from his waist belt as trophies, a testament to the fighting prowess of the Samurai Predator. 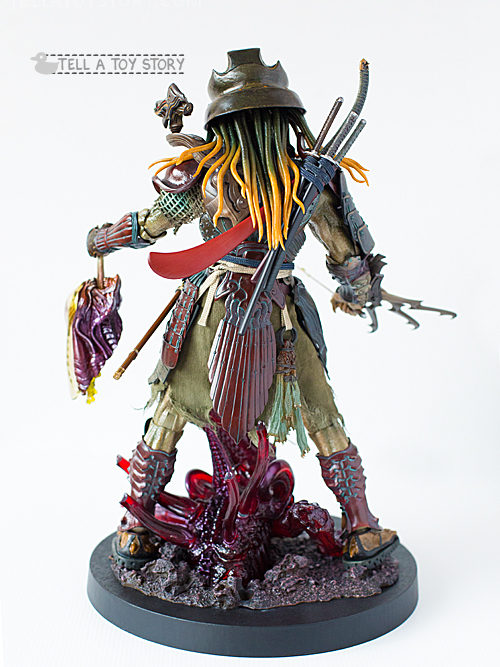 Side view of the Samurai Predator. 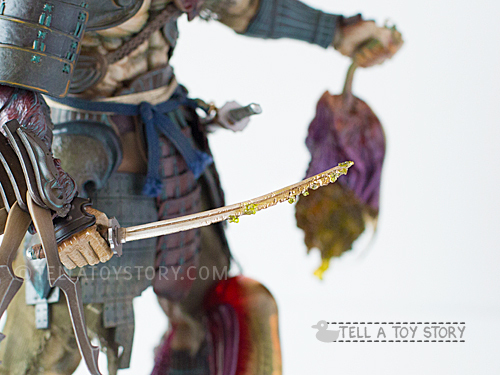 The katana in the Samurai Predator’s right hand has intricate nicks, dents and Alien blood on it, evidently from the fierce battle that just ended. 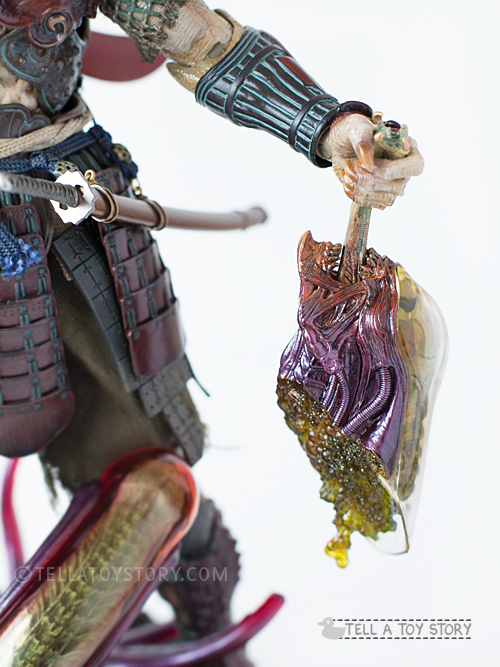 The highly corrosive Alien blood melts through the katana even though it is forged from a rare metal. 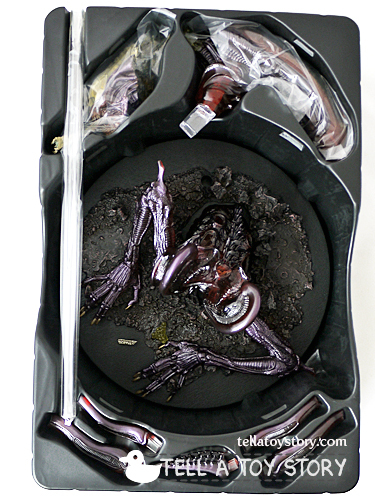 The broken tip lies on the ground in front of the Alien corpse. The severed Alien head hanging by its tongue. Another trophy for the victorious Samurai Predator. 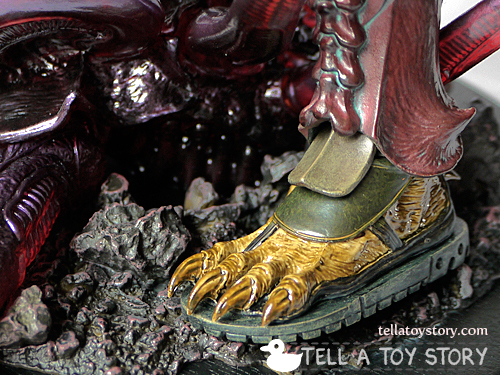 The remains of the Alien lie at the feet of the Samurai Predator. Probably still twitching as it oozes acidic blood from what’s left of its head. 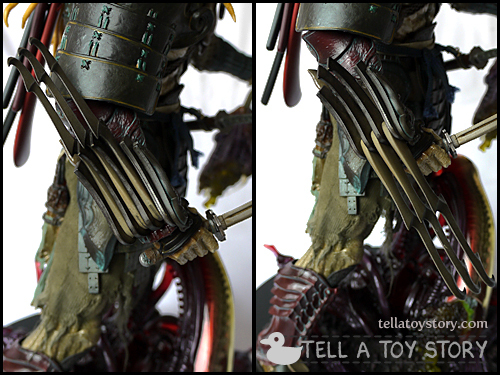 No Predator is complete without his wrist blades and the Samurai Predator has 3 beautifully designed ones on his right gauntlet that can be positioned independently. The sandals are a blend of modern and classic designs. Additional closed and open hands are included. 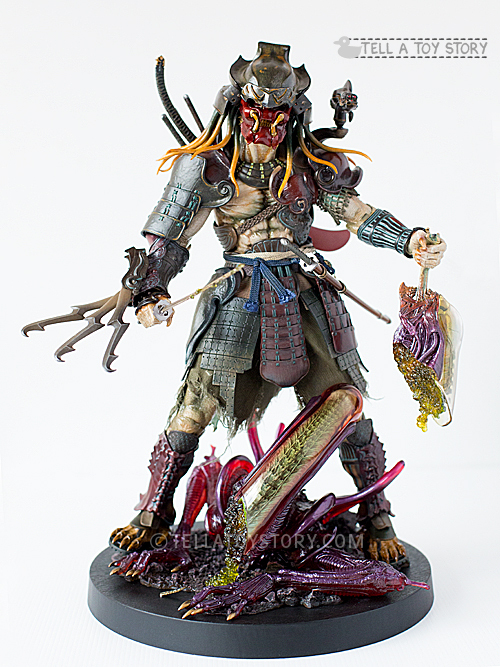 Overall, this is a very unique figure and the artistic interpretation of a Predator being a Samurai warrior is believable. 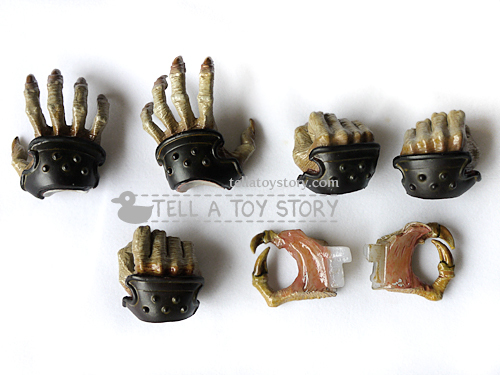 The design of the costume and accessories are all well-thought through. 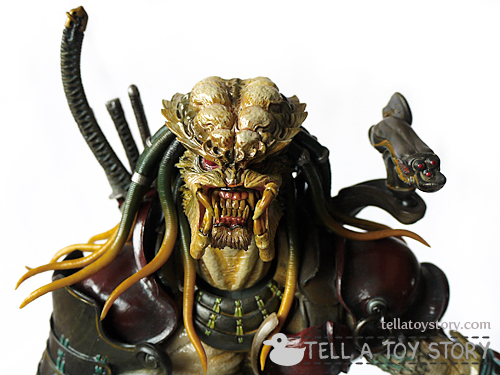 The Samurai Predator is certainly a worthy addition to the collection of any Alien vs Predator fan. i want to buy it , how much for this ?? I got this when it was first released in SG. You can look for it on ebay or China Square Central (CSC) if you are from SG, prices might be higher now. 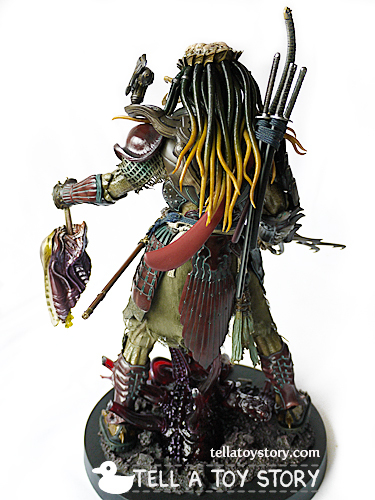 How does the predator attached the swords on his back?